Chilli’s have antiseptic properties as well as the ability to increase circulation and desensitise pain. They are often added to lotions and balms to relieve muscle pain. Interestingly the seeds are not the hottest part of the chilli pepper, it is the white membrane where the seed is attached that gives the strongest flavour. 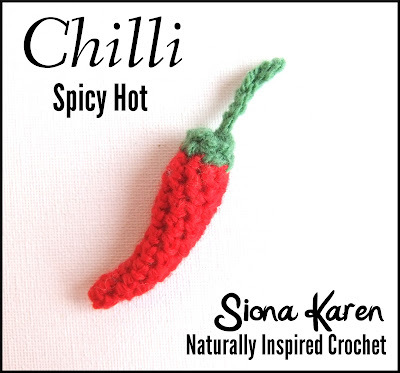 The finished chilli is approximately 3” (7cm) in diameter. This pepper would be beautiful as a brooch or as a decoration for the home. DK acrylic yarn in bright red and leaf green.